Helene’s first book is a contribution to three different historiographies: imperial history, international history and the regional history of the Middle East. 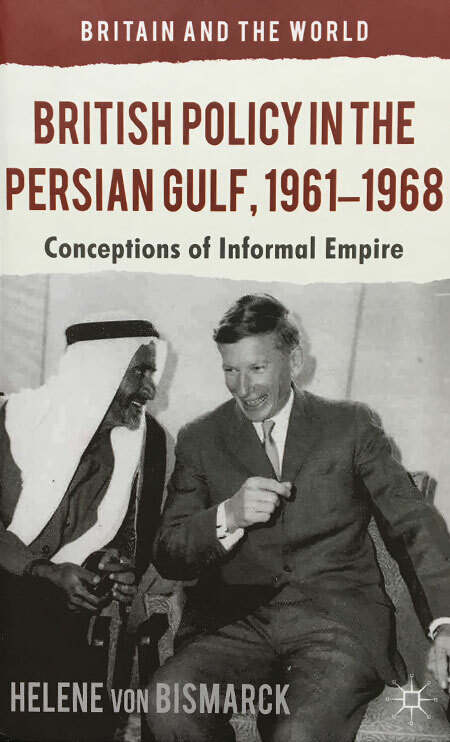 It examines Britain’s policy in the oil-rich Persian Gulf, starting with the independence of Kuwait in June 1961 and ending with the decision of the British Government in January 1968 to withdraw militarily from East of Suez. It is a study of the logic and the dynamic of British imperialism at a time when large parts of the European colonial empires were involved in or had already completed the process of decolonization. Rather than wondering why the British ultimately left the Persian Gulf, Helene analyzes how they protected their substantial economic and strategic interests there until they did. For most of the 1960s, Britain’s Persian Gulf policy was not concerned with the inevitability of eventual retreat but with the dilemma of maintaining an informal empire without appearing too imperial. The British decision-makers in authority defined Britain’s role in the Gulf as an interdependent system of military power, formal treaty rights and political influence that included the treaty-bound states of Bahrain, Qatar and the seven Trucial States (today’s United Arab Emirates), as well as the officially independent states of Kuwait and Oman. These states were extremely wealthy in natural resources, but they were also vulnerable to the territorial ambitions of their larger neighbours, Saudi Arabia, Iraq and Iran. From the perspective of the British Government, the Persian Gulf was a power vacuum Britain had to fill. The enormous profits companies like British Petroleum (BP) or Royal Dutch Shell made in the Gulf significantly benefitted Britain’s balance of payments. Though they wished for the overall support of the US Government, the British policy-makers did not want their American counterparts to become too involved in the day-to-day of Gulf affairs. The main challenge was to ensure the continued flow of Persian Gulf oil to the West, without inflaming Arab nationalist sentiment or provoking the intervention of the United Nations. British power in the Persian Gulf depended on the trust and cooperation of the local rulers. When a ruler refused to cooperate, which happened in Sharjah in 1965 and in Abu Dhabi in 1966, the British Government secretly engineered his deposition and replacement with another member of the respective ruling family. Helene’s book is the first to prove and explain in detail the involvement of the British Government in the overthrow of both Shaikh Saqr bin Sultan Al-Qasimi of Sharjah and Shaikh Shakhbut bin Sultan Al-Nahyan of Abu Dhabi. Conceptions of Informal Empire is mainly based on research in the National Archives of the United Kingdom in Kew. The US National Archives and Records Administration in College Park, Maryland, were used as a supporting source. The book has been reviewed in a significant number of academic journals, including the American Historical Review (PDF), the Journal for British Studies (PDF), the Middle East Journal (PDF), the Journal of Arabian Studies (PDF), Diplomacy and Statecraft, Middle Eastern Studies and Asian Affairs. Helene’s new research project concerns itself with two towering figures in the history of european integration: Britain’s Prime Minister Margaret Thatcher and the European Commission President Jacques Delors. The 1980s, when they were both in office, were a crucial time for the European Community. The deadlock that had characterized the 1970s was followed by a series of far-reaching integrative measures during the 1980s, ultimately leading to the creation of the European Union with the Treaties of Maastricht in 1991. While Jacques Delors has been widely perceived as the very embodiment of this development towards more integration, Margaret Thatcher has been remembered as an obstructive force, full of dismissive rhetoric about any kind of ‘Euroenthusiasm’. Helene’s aim is to gain a more nuanced view not only of the relationship between Thatcher and Delors, but of the roles they both played in the European integration process. She seeks to address the following questions: To what degree did Thatcher’s enthusiasm for free markets and deregulation and Delors’ background as a French catholic and member of the socialist party inform their views on european integration? Were their plans and policies for Europe motivated by conviction or by pragmatism? How and why did their ideas for the European Community change over time? Did they always clash or was there a time when Thatcher’s and Delors’ aims overlapped? To gain as full a picture as possible, Helene is examining English, French, German and Italian sources for this project, including records from government archives, memoirs and interviews.